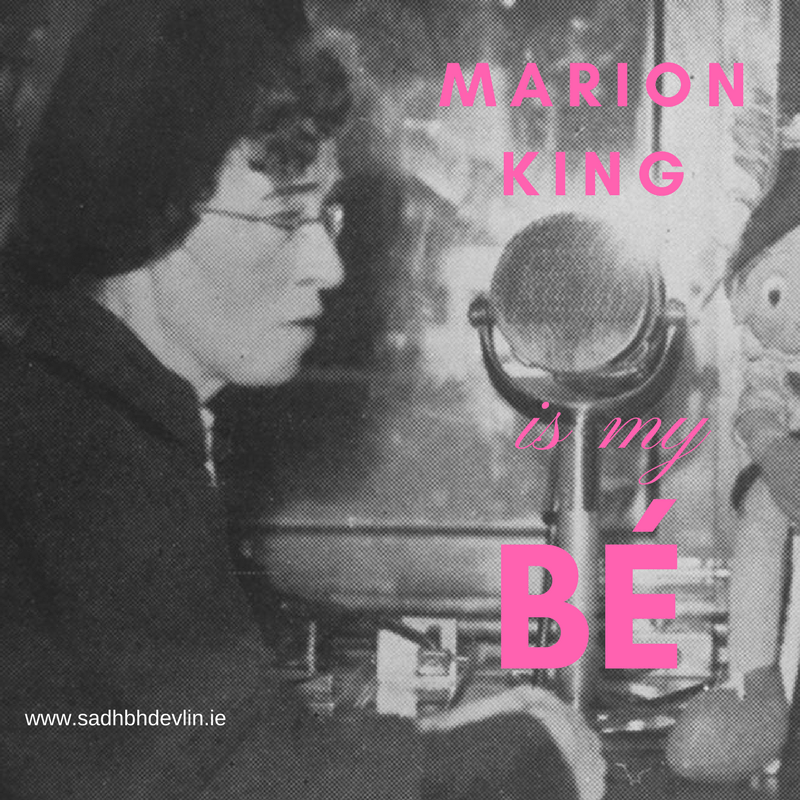 Cé hí Marion King - údar, ealaíntóir, craoltóir agus bé! 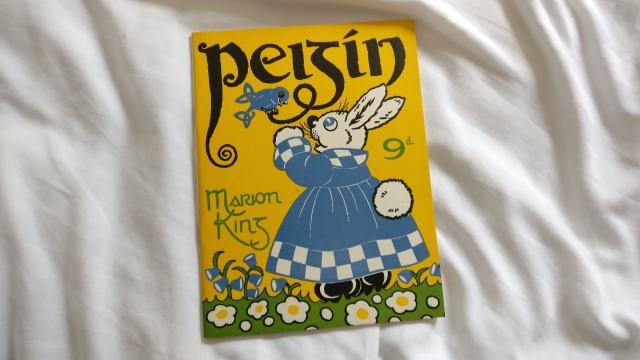 Agus mé ar saoire thar an Samhradh i gCorca Dhuibhne, tháinig mé ar an leabhar álainn seo – Peigín, le Marion King, sa Chaifé Liteartha. Thaitin an ealaín liom an nóiméad a chonaic mé san fhuinneog é agus cheannaigh mé é ar €5, ar an bpointe. Mar sin, is dócha gur cóip é atá fós ag crochadh thart (n’fheadar cá háit?!) ó 1948! Spreag an tuiscint seo mé le beagán tochailt a dhéanamh agus thosaigh mé le cuardach a dhéanamh ar ainm an údair. Níor chualas riamh trácht ar Marion King roimhe seo, agus leis an fhírinne a rá – níl mórán eolas fúithi ar líne le tuilleadh a fhoghlaim – ach thaitin an méid a d’fhoghlaim mé liom go mór. Ba chartúnaí, maisitheoir agus péintéir í Marion King (1897 – 13 Iúil 1963). Rugadh i mBaile Átha Throim í ach tógadh i Leeds í, áit a dhéan sí staidéir i Leeds College of Art. D’fhill sí ar Éireann i 1922 agus lonnaigh sí í féin i mBaile na Manach, BÁC. Bhíodh taispeántaisí ealaíne aici go rialta agus scríobh sí agus mhaisigh sí sraith leabhair do pháistí le téacs Gaeilge. (N’fheadar an raibh Gaeilge aici í féin?) Bhíodh clár raidió aici freisin ar RTÉ – Drawing and Painting with Marion King, a thosnaigh i 1943. 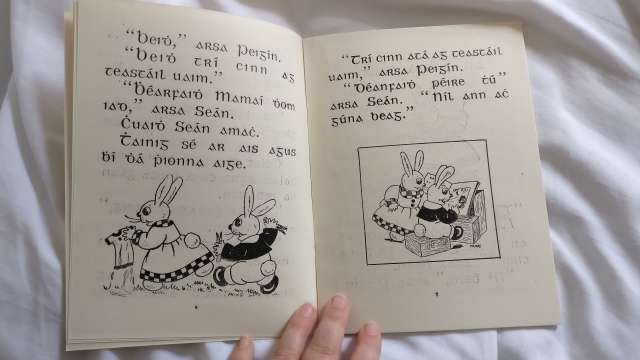 Ceann de na caractéirí is cáiliúla a bhí aici ná Seán Bunny, a raibh stiallghreannán aige ‘The Adventures of Seán Bunny’ san Irish Times ó 1953 go dtí gur éag King i 1963. 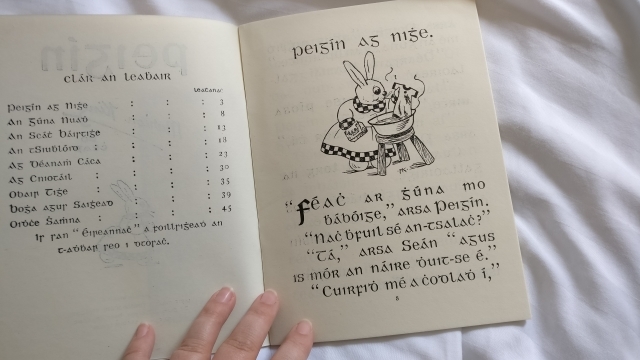 Tá coinín d’arbh ainm Seán le feiscint sa leabhar beag a fuair mise, agus is í Peigín a dheirfiúir – is dócha gurb ionann an Seán seo agus Seán Bunny san Irish Times, ach nach deas go bhfuil an spot-sholas ar Pheigín sa leabhar beag seo?! Ba léir go raibh an-ghrá ag páistí na tíre do King. Tríd a seó raidió Drawing and Painting with Marion King agus clár eile ‘Art Adventures’ bhunaigh sí taispeántas ealaíne blianitúil d’obair ealaíne páistí. Sheol Erskine Childers é féin an chéad ceann agus is léir go raibh an tóir air agus gur thaisteal an taispeántas thart timpeall na tíre. 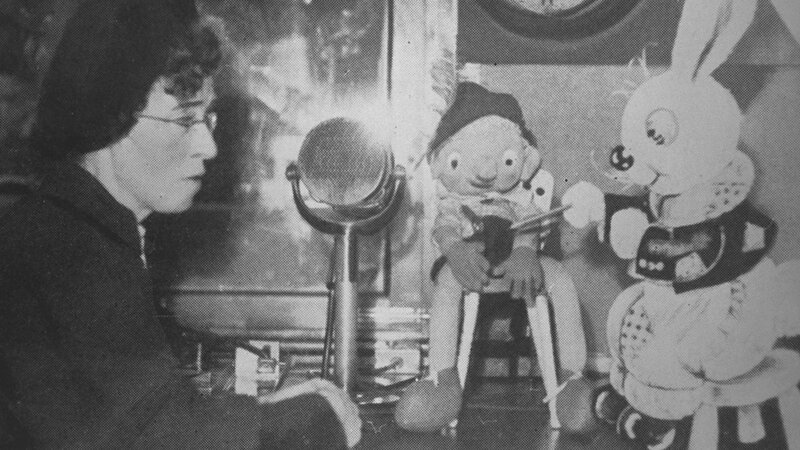 One of Roddy’s “finds” in the 1940s was Marion King, one of the first and longest-enduring personalities in Irish children’s radio. King’s slight speech impediment made her a rather unlikely presenter, and it is quite possible that she would have failed an audition today, but she had such a talent for communicating with young people that she remained in the often transient world of children’s broadcasting for 20 years. In 1943, King suggested a radio programme for children interested in learning to draw. The late Seamus Kavanagh, who would later take over from Roddy as head of children’s programmes, recalled that the reaction at Radio Eireann was understandably negative. “The idea did seem ridiculous, but Miss Marion King enthusiastically pooh-poohed objections and set to work. She announced flatly that she did not intend to “teach”, at least not in the school sense of the word, but that her objective was to awaken the imagination of the children and to encourage them to draw,” he said. Is breá liom go raibh sí chomh tiomanta páistí a spreagadh le bheith cruthaitheach! Ní hiad scéalta faoi coiníní an t-aon rud a scríobh sí, áfach. Cúpla teidil eile uaithi a tháinig mé orthu ná: Gug, Baba, Cáit agus Cól (Scéilín Nodlag) ach níl aon clú agam cén saghas scéalta iad. Chonaic mé go raibh cúpla ceann ar fáil ó deBúrca Rare Books ar €275 an ceann! N’fheadar an bhfuil luach níos mó ná an €5 a d’íoc mé ar mo ‘Pheigín’, más ea?! Braithim daimh éigin le Marion King, caithfidh mé a rá. Is breá liom an chruthaitheacht a spreagadh i bpáistí, táim ag obair i saol na craoltóireachta agus freisin táim ag scríobh do pháistí – dá mbeadh bua na péintéireachta agam freisin bheadh ‘pacáiste iomlán’ Marion agam, ach faraoir níl – mar sin beidh sí agam mar bhé as seo amach. Tá mé ag lorg í. Ní raibh í ag RTE Archives. Beidg aon chabhair a bheith buíoch. Ní féidir liomsa teacht ar a guth ach oiread! B’fhéidir gur fearr dul I dteagmháil le RTÉ. Caithfidh go bhfuil archives acu di. Bhíodh na leabhair sin agamsa nuair a Bhí mé óg. D’éist mé le Drawing and Painting le Marion King gach seachtain. Bhuaigh mé duais bheag seachtain amháin! !